A quote taken from the book The Girl With A Dragon Tattoo. 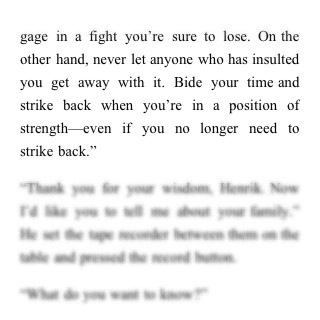 The prior line was “Never engage…” This paragraph had a profound impact on me when I first read it. It made so much sense, even more so when my mentor said almost the same thing to me few days ago over lunch. What an coincidental symmetry. So I have been reading crime novels written by the late Swedish author and journalist Stieg Larsson recently and I’ve been completely blown away. Which led me to a conundrum about the original books which were published in Swedish. Either he’s such a brilliant writer that his talent shines through despite the languages that the books were published in or he quite simply had a brilliant English translator. The author is also unafraid to throw in big words to educate the reader (it is most likely just me being educated here but hey, I’m proud to admit my vocabulary has expanded from reading his books) or insert social issues to raise the reader’s awareness or add in strong Swedish-centric elements that may alienate non-Swedes. I have never been to Sweden but I feel that I know a bit more about the country now. What I’m trying to say is Larsson treats his readers as a bunch of intelligent, objective and knowledge-thirsty audience. Which quite frankly is the opposite of what newsrooms and magazine publishers all over the world have been secretly telling journalists for years. Yes, we have been told to always keep our copy simple and treat the readers like idiots. “Explain succinctly, use simple words, don’t overload your readers with too much technical jargon or boring stuff, get right to the issue” are some of the often heard mantras. So yes, this is refreshing and a style I’d aspire to emulate if I were to write a book.